Step 1. Access the Overview of Access Profiles page. 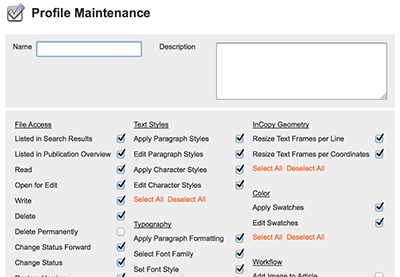 In the Maintenance menu or on the Home page, click Access Profiles. The Overview of Access Profiles page appears. A default profile, Full Control, already exists. The Profile Maintenance page appears. Step 3. In the Name box, enter a name for the profile. Step 4. (Optional, but recommended) In the Description box, enter a description that explains the purpose of the profile. Step 5. Decide for this profile which access rights and/or features should be enabled and which ones should be disabled by selecting and/or clearing the relevant check boxes. 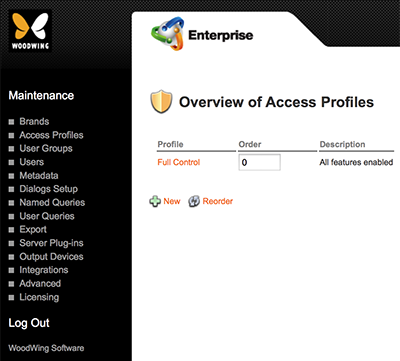 The Overview of Access Profiles page appears with the new Access Profile set added to the list. The Overview of Access Profiles page appears. Step 2. Click on the name of the profile that needs to be updated. The Profile Maintenance page for that profile appears. Step 3. Modify any of the properties. Step 4. Click Update to save any made changes. Step 2. Click on the name of the profile that needs to be removed. Step 3. At the bottom of the page, click Delete. Step 2. Enter a number in the Order box for each Access Profile. The higher the number, the lower the Access Profile will end up on the list. The list is sorted in ascending order.